In October 1974, a group gathered in Wyalusing State Park, Wisconsin, to discuss founding a forum for people working in state and private natural areas programs–a place for them to come together, support each other and exchange information. This was the very first Natural Areas Conference, a tradition that we have continued annually for more than 40 years. These were still early days for the natural areas movement. As states began cataloging their land in the 1950s and 60s, people passionate about land began to encourage the government to set aside nature preserves and create programs to help maintain them. The public benefit of setting aside land for protection was a new concept to many states at that time. Natural Areas Association members worked to gain wider acceptance for the idea, and helped states set up mechanisms for preserving natural areas. George Fell, one of our founders, established the first state system of legally protected nature preserves in the nation when he wrote the Nature Preserves Commission Act for Illinois in 1963. The Act was used as a model and inspiration for many states, which created their own preserves. Even as they took hold and began to grow, early state-level natural areas programs were often just a couple of people, with little funding. They were scattered across the country, sometimes lacked support, and faced a shortage of reliable science for maintaining lands they were charged with keeping safe. In 1978, at the fifth annual Natural Areas Conference in Missouri, the 53 members in attendance decided to incorporate the group into an association with a view towards addressing some of these issues. 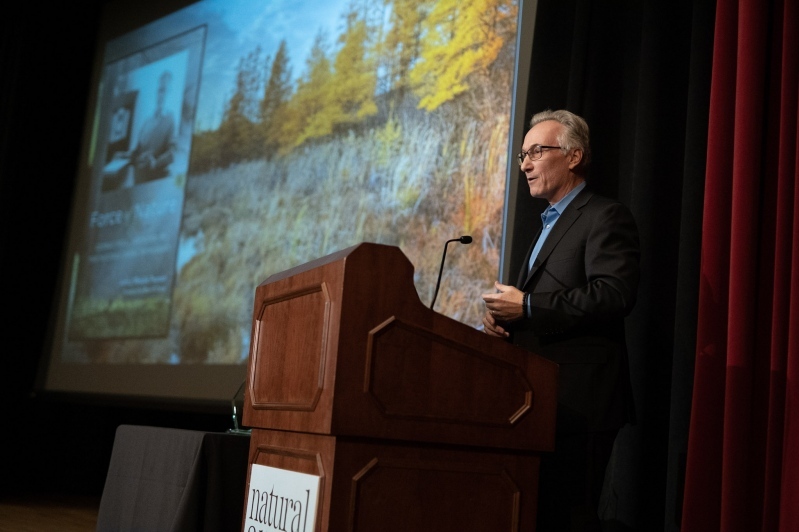 The Natural Areas Association would be “a professional society for people working the natural area preservation and management field,” said John Schwegman, who served as the group’s first president. Throughout the 1980s and 90s, the association continued to grow so that it could better support the expanding community of people working in natural areas programs. In 1981, we founded the Natural Areas Journal to bridge the gap between those who conduct cutting-edge research on natural areas and those who manage and use them. It began as an all-volunteer effort—“just a file cabinet and a typewriter,” says Greg Iffrig, the journal’s first editor. Today, the journal has a staff of 3 and is distributed to libraries across the country and to all members as part of the benefits of membership. In 1987, the George B. Fell Awards were founded, to honor the career and memory of one of the co-founders of the Natural Areas Association and to recognize people who make a major contribution to the preservation of natural areas. We have a rich history – more coming soon. 1996-99 Hank R. Tyler, Jr.